Front (left to right): 1. Bradford Lindsey, 2. Joseph Chaney, 3. Robert Miller, 4. George Wilson, 5. unidentified, 6. Ronald Carling, 7. Loren Converse, 8. Robert Badcock, 9. David Christensen, 10. Kalbert Lowe. Second row: 1. Lou Rowen, 2. unidentified, 3. Pamela Derby, 4. Cynthia Waters, 5. Lora Nay, 6. Tana Gay, 7. Pamela Godfrey, 8. unidentified, 9. Joyce Milochik, 10. Linda Powers, 11. unidentified. Back row: 1. Scott Dyson, 2. David Cockey, 3. Kerry Taylor, 4. Keith Jaeger, 5. Leonard Converse, 6. James Lenz, 7. Mr. Woodworth. Notes: According to the school's current website, the correct spelling is "Marylin". Credits: From the collection of Ron Silcocks. 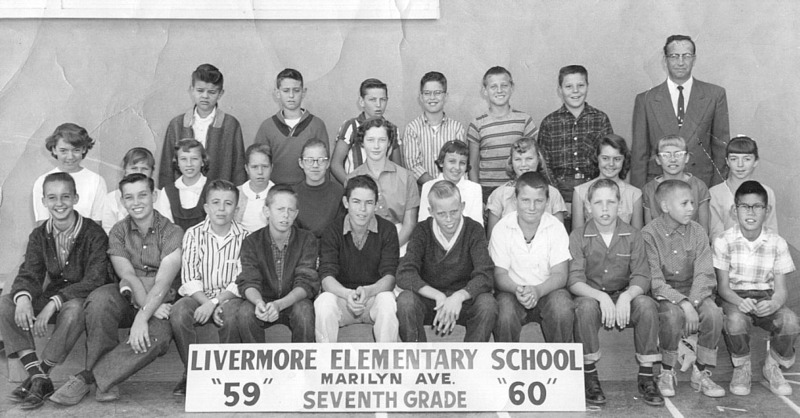 Thanks to Ron Silcocks and David Smith for identifying the kids in this picture.